This week’s Read Up On It delves into the wonders of fermentation, Nova Scotia wine, and “microwave popcorn lung”. Check out this week’s tasty tidbits. First, something a little absurd. A man in the U.S. has been awarded $7 million USD for damages caused by inhaling the fumes from microwave popcorn. He was diagnosed with “microwave popcorn lung.” And of course, this story comes from Gawker. The Coast has devoted a lot of space to Nova Scotia’s wine industry in this week’s issue. Stories about changes in laws on liquor laws, Wolfville’s “Winery Bus“, and the buzz about bubbles coming from Benjamin Bridge. Speaking of bevvies, the Globe and Mail talks about a recent interest in fruit brandies. Maclean’s is putting out a special edition issue all about “Canada’s best restaurants”. Check out a sneak peek. Bon Appetit talks about the twittering masses discussing the most important gastronomic issue of our time: brioche buns as burger buns. Yay or nay? I say “nay”. The New York Times interviews Mr. Fermentation, Sandor Katz, to talk about fermentation, microbes and more. Finally, if you haven’t seen this all over social media this week, you probably live under a rock without 3G coverage. Nick Offerman, a.k.a. Ron Swanson from Parks & Recreations, doing slam poetry about bacon. This summer I decided I wanted to open a camp—a Crystal Lake-minus-the-murders style camp—called Camp Firewood. Ok, so I decided I wanted to pretend that I wanted to open a camp. I’m not going to open a camp. But if you spend any time driving around rural PEI, you’ll understand why my fancy ended up with a bit of a tickle: basically every single roadside sign advertising firewood for sale has “CAMP FIREWOOD” on a piece of plywood in a hand-painted all-caps scrawl. They may think they’re just selling logs, but what they’re selling is the wet, hot Canadian dream of a rustic campground franchise. Camp Firewood came to life for me a little bit this week down at the Land of Evangeline Campground in Grand Pré, not far from Wolfville. The 2012 Canadian Chef’s Congress rolled into town only to unroll dozens of sleeping bags, pitch a village full of tents and basically go nuts. A flag for the Congress was planted at the top of the campground. The stiff, wrinkled sheet was taped awkwardly to a spindly pole looking for all the world like a project taken from a summer camp arts and crafts cabin and thrust into the ground to declare the birth of a new nation in some kind of a Lord of the Flies fit. Luckily for everybody involved, the only Piggy in sight was the one that they roasted for tonight’s dinner. This week’s Read Up On It includes everything from coffee to salmon, sustainable seafood, minerality in wines and how to make your own salt. When life gives you lemons, don’t make lemonade. Season with them. 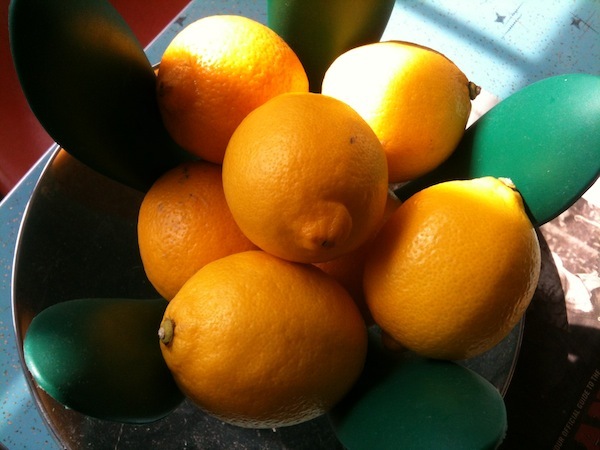 Slate looks into lemons as the new salt and pepper. The New York Times seems to be having a little love affair with Nova Scotia. James Beard Award winning author Joan Nathan explores the southern tip of the province, talks about smoked salmon, and why the “Nova” in “Nova lox” doesn’t always mean Nova Scotia. Speaking of seafood from our region, you might want to skimp on the shellfish for a while, or so reports the CBC. The Globe and Mail looks into the usage of the term “minerality” in wine, and how it has nothing to do with rocks in the soil. Speaking of minerals, Michael Ruhlman looks into making salt at home. Too many plums? The Washington Post advises you to make slivovitz, that wonderful hungarian hooch. With a lot of talk around sustainability in seafood, Bon Appetit heads to Houston to find a group of fishmongers and chefs who are using up the bycatch in a smart way. What does Ron Swanson eat? A lot of eggs, meat and more meat, usually in bacon form. This supercut from Vulture proves it. And finally, for the coffee hounds out there, a book for you. I’m pretty lucky that I get to write about food. I don’t do resto reviews (that’s another person’s game) but I do view eating and reading about food as research. It’s important for me to know the difference between beurre monté and beurre manié or how tripe can be made into a delicious meal. If a writer who deals in politics didn’t know the significant differences and intricacies between the various political parties, would you trust them? But if I had to chose one of my favourite things to eat, it’s not something delicate or obscure, or costly. It’s actually cheap, both in price and in character. I don’t know what happened, but this week there were some pretty amazing stories about food posted online. Everything from the serious (studies on organic farming) to the trends (home canning, temperance cocktails) to the surreal (ice cream nachos, McDonalds going vegetarian in India). It’s Read Up On It! – Baskin Robbins is either sick or smart. I haven’t decided yet.Ice cream nachos? Gawker asks, WTF? The Globe and Mail had some pretty interesting stories this week. First, a piece about the recent surge of urbanites who do their own bottling/canning . Apparently the lion’s share of sales of canning jars is in urban, not rural areas. Neat. Then a story by Wency Leung about what is arguably the most maligned of sandwhich meats: bologna (or baloney, depending on who you talk to). Finally, a report on a subject that we are maritimers should be proud of: moonshine, and the people who make it (legally, that is). McDonald’s used to fry their fries in beef tallow, rather than veg oil. That wouldn’t have flown at their most recent venture, a vegetarian-only resto in India. I’m a huge fan of burdock and dandelion soda/root beer. What I didn’t know is that it was fostered through the temperance movement. Now with the recent interest in mixology (how I hate that word), temperance “cocktails” have found their own nice in the U.K.
I’d be interested to know what the deal is for Canada, but in the U.S., 80% of the antibiotics produced in the country go straight into the food chain, and a lot of it is unregulated. The New York Times looks into it. Also at the NYT, a story about how Taipei may be the greatest place to eat food in China, and how restaurants are keeping stock of what you like, what you don’t like and who you are. Finally, I don’t even live in Los Angeles, but I read/follow Jonathan Gold’s reviews all the time. Believer sits down with him and talks about food criticism and snobbery, and eating live octopus is perhaps a bit more fucked up than you think it is. Organic vs conventional: Is it enough? A recent study put out by Stanford University was all over the news this week. The study posited that organically grown foods are nutritionally equivalent to those grown by conventional means. The conversation in much of the media soon became an all too easy vilification of organic farming and farmers, specifically around the cost of the items produced in these manners. “If it’s the same thing, why should I pay more?” was the predominant question/comment. The thing is, it’s not the same thing. And that’s not the question that should be asked here. The questions should be, “Does it matter if the foods are nurtitionally equivalent?” No. It doesn’t. Nutrition isn’t the key ingredient in this equation. Ecology and ethics are. Is organic farming the right way to grow food? That depends on what organic farming is. Great article man. What are your thoughts on a more wild food based diet? On the left: Indochine Banh Mi’s sate pork sandwich. 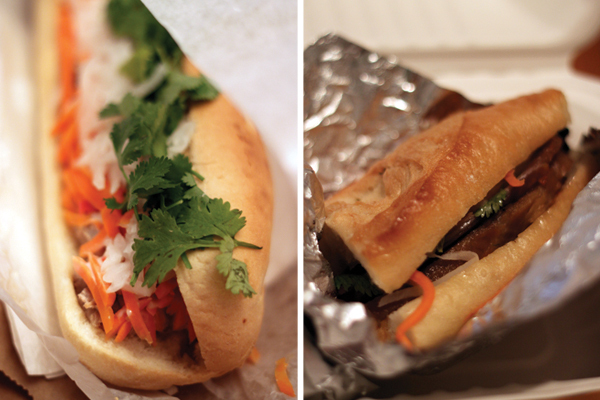 On the right: Fid Resto’s backdoor banh mi. Two sandwiches, one neighbourhood. Can we handle it? Can both survive? SHOULD both survive? I mean, imagine having two options for one niche food item in this city, let alone within two or three blocks of one another. That is just not the Halifax we live in, you guys. Will we stand for this? I don’t think so. So which one is the best and which one should we chase out of town with pitchforks and torches? Does Fid have any good vegetarian options? In my opinion, I do not find the meat dry, although I don’t eat red meat, the chicken has never been dry.